If a dog has dry skin on its ears, it could be painful and irritating. It could also be the result of a medical condition or even parasites. A veterinarian can recommend the best solution for the dog's dry ear problem. Some symptoms of dry skin on a dog's ears include frequent ear scratching, head shaking, dry and flaking skin, painful ears, or rubbing its face on the ground to relieve itching. Dry ear skin may be the result of allergies, fleas, mites, infection or dietary deficiency. Or it could just be the result of extremely dry skin. A veterinarian may examine the ear and dry skin, as well as check for parasites. 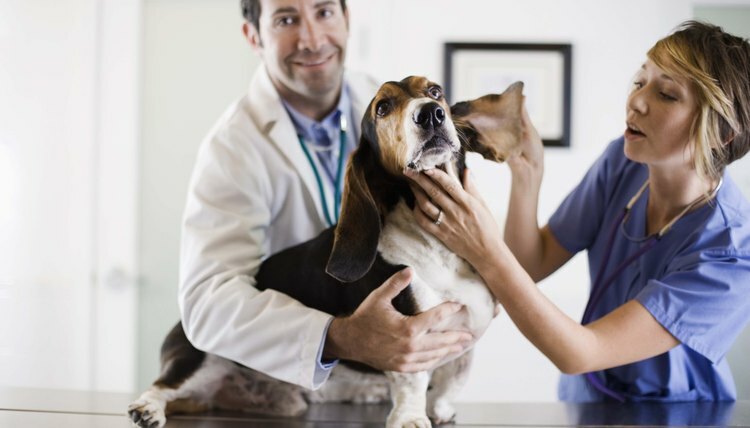 The veterinarian may also want to run allergy tests and take a thorough medical history to determine the cause and treatment of the dog's dry ear skin. Depending on the cause of the dry ear skin, treatment may include cleaning the ears, treating for parasites or infection, administration of antibiotic or anti-itch creams, allergy medication, application of moisturizer, or dietary changes. Keep the dog's ears as clean as possible by doing routine cleanings and checking or parasites. Moisturize the ears using hand cream, fly ointment (available at feed stores) or the liquid inside vitamin E capsules. Feed the dog a high-quality diet and supplement it with omega-3 fatty acids.